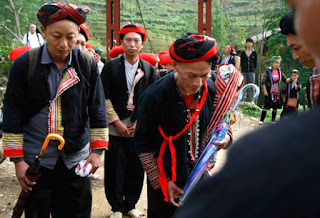 Ceremony ritual identity is unique and has been maintained from thousands of generations in the community of Red Dao people in Sapa. 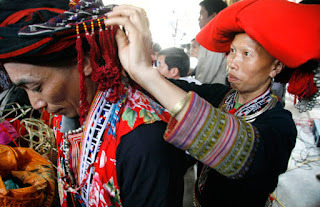 According to the concept of the Dao people, the “Cap Sac” is an indispensable procedure in the life of men. And only the new identity is considered to be adult men. Mass excellent level of Dao people have many grades, the first grade is level 3 lights and 36 Soldiers; step 2 is level 7 with 72 Soldiers and final grade is 12lights with 120 soldiers. The one who got ceremony must know the procedure very well. 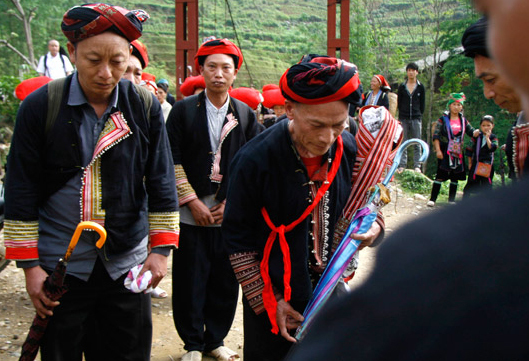 The main ritual of identity comprises ceremony to present pig, chicken to prey ancestors. Before the ritual, the shaman must disinfect the homes of the man, then beat the drum to invite the ancestors come home at that time. He also gradually opening to report to the ancestors know the reason for the celebration. Time of celebration from 1 to 5 days. After pray, shaman applying for yin and yang, if divine agree, the man is going to sound officially named and recognized as adults. After ceremony the man has to call shaman as father. Ceremony of the Dao people is highly educated, embodied in the teachings people. The man must be a good man, He not allow to do badly.